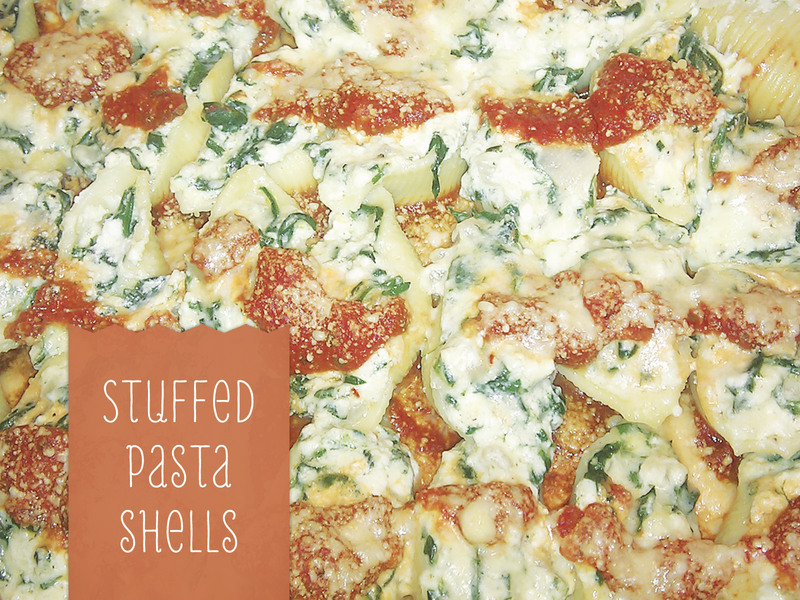 Ricotta and spinach stuffed pasta shells? Yum!! Not only was this recipe easy to make, but it was easy to make in advance. Simply prep the filling while the pasta cooks, fill the shells, and arrange with pasta sauce in a casserole dish. Actually, this recipe yielded so many stuffed shells that I ended up using two casserole dishes...even despite my constant taste testing. Then pop the dish in the fridge until ready to bake. Great for entertaining! Google Images lead me to this recipe from Canadian Family. I think my shells may have been a little bit smaller, and I cooked about 3/4 of the box in case some of the pasta broke/landed in my mouth. I also spent a lot of time looking at this recipe from Indigo's Sugar Spectrum because of all the beautiful photographs that show what the cooking process should look like. Preheat oven to 350° F (175° C) and put on a pot of boiling water. Generously salt water and add pasta shells, cooking until al dente, or a few minutes less than package instructions. Drain pasta and toss with 1 tbsp olive oil. In a large bowl, mix spinach, ricotta, 3/4 cup Parmesan, egg, pesto, lemon zest, nutmeg, and salt and pepper. Spread 2 cups tomato sauce on bottom of 13 x 9-inch baking dish. Generously fill each shell with ricotta mixture (about 1 1/2 tbsp depending on shells) and arrange on top of tomato sauce. Place dollops of remaining sauce on top of pasta shells and sprinkle with remaining Parmesan. Cover with foil and bake for 30 minutes. Then remove foil and bake another 5 minutes, or until cheese is bubbly and golden brown. YUM!